Retrace gives you the ability to see all active alerts in a single location under the Alerts screen. 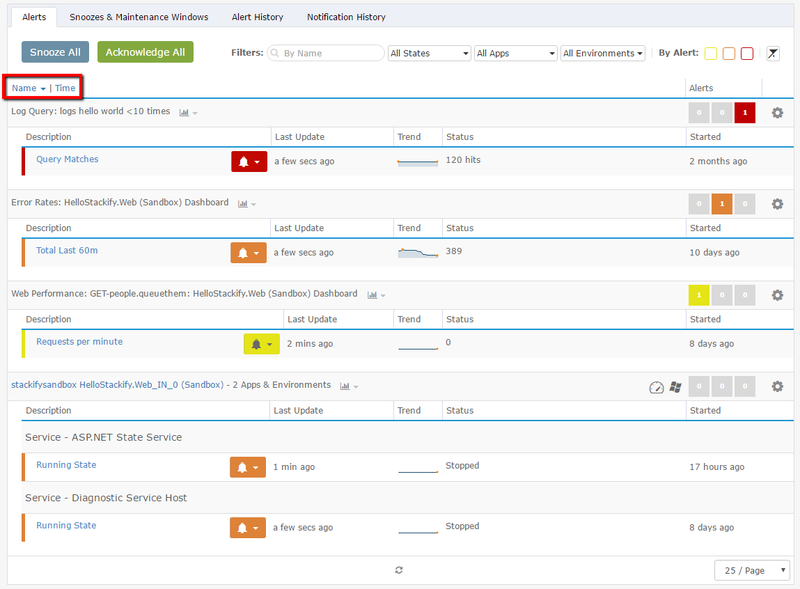 Here, you can see all active alerts grouped for easy visibility across the entire install base, and you can respond to the alerts from here as well if you wish. From the Alerts page, you can sort alerts (within each server group) by either Name or Alert Started time. You can also acknowledge alerts right from the Alerts page as well. All global alerts and notifications that are triggered can be viewed in the Alerts and Notification History. In the Alerts History you can see what the alert was and where it came from, and in the Notification History you can see which recipients were notified and how. Notification Groups can be configured to control who gets certain notifications. Read more in the Notification Groups article. Retrace offers you a couple of ways to respond to Alerts: Acknowledge and Snooze. When Acknowledging an Alert, you are effectively shutting down Notifications via email and SMS until the Alert "cycles" (more on that further down). When Snoozing an Alert, you are making a choice to silence Notifications either for yourself or for everyone for a specific window of time. We'll cover both ways to do this below. Clicking the Alert gives you the option to either Acknowledge or Snooze. When you choose to Acknowledge, you are telling Retrace that someone is responding to the issue, and further Notifications are no longer necessary until there is a cycling and reintroduction of the Alert. In other words, unless the event causing the Alert dies down and then comes back again, don't send any more notifications. From the Global Alerts page, you can choose to Acknowledge just one particular Alert, or all Alerts for that specific server. Once an Alert (or all Alerts for the server) are Acknowledged, no more Notifications will go out for that Alert or server to any of the Notification Groups. Snoozing an Alert simply pauses the Notifications from sending out emails and SMS messages for a specified period of time. If you choose to Snooze an Alert instead of Acknowledging it, you have a couple of choices to make. You are able to either Snooze for just yourself, meaning all others who are in the chosen Notification Groups will continue to get Notifications until someone finally Acknowledges the Alert or until the problem is resolved. You can Snooze for everyone, meaning no one will receive Notifications during the specified time. Again, like with Acknowledge, you can choose if this Snooze applies only to the individual Alert, or to all active Alerts on the chosen server, or to snooze all active alerts universally. Use the slider as shown above to specify the time for the alerts to be snoozed. Maintenance Windows are used to suppress all alerts for a configured amount of time. This is useful for scheduled maintenance or eliminating alerts when exceeded monitor thresholds are expected temporarily. 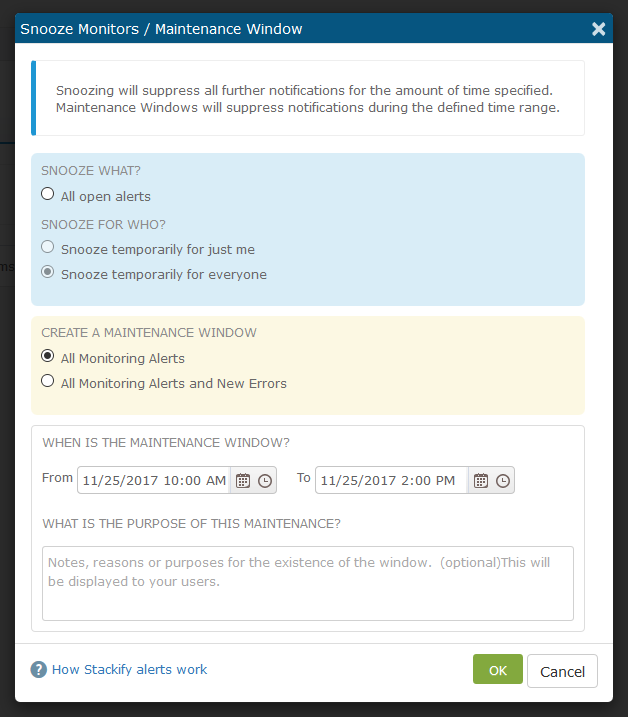 By navigating to the "Snoozes and Maintenance Windows" Tab, you will see a list of all snoozed alerts and maintenance windows. The chart will also tell you who the snooze is targeted for and how long it is in effect. You can also remove or extend snoozed alerts or maintenance windows by using the icons on the right. You will see any active Maintenance Windows on the top menu bar. Clicking on the banner will take you to the Snoozes and Maintenance Windows Settings tab where you can remove or extend the window. 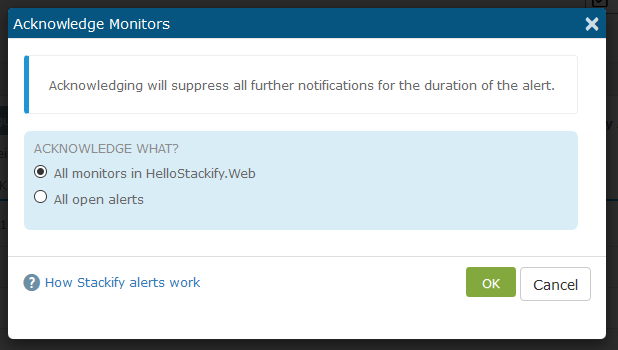 You can also work with alerts and notifications within a specific App Dashboard. The scope will be set to the current App and Environments selected. Here you will see alerts for the selected Environments, and all relevant information including severity, error category, brief description, device (if applicable), the environment that the alert originated from, start time, and end time if the alert has cleared. The Notification History tab will list all recent notification emails and SMS messages that were sent for the app in the selected Environments. 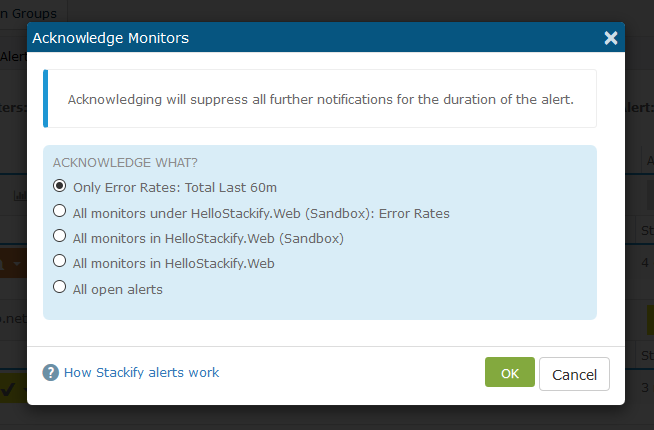 From the Monitoring tab you can Ackowledge and Snooze Active Alerts. In this scenario, you are able to Acknowledge all active Alerts for the chosen App across all active environments. Snooze also applies from the App Dashboard across all monitors for the App within the selected environment, with the remainder of the functionality the same as above.